Today Spick and Span window cleaners succeeded in cleaning the windows of a whole house for a client who complained that a previous window cleaner had made it up to the third floor only .After the job’s completion this client vowed, never again to use her previous cleaner, but in the future to use only Spick and Span to provide her with window cleaning services. Spick and Span window cleaning were contacted a few days ago and asked to come down to Camberwell, SE5 for a client who wanted the home to look neat and tidy for her tenants as well some guests that she is soon expecting to arrive. Spick and Span were more than happy to clean the Georgian glass of this period property set in the south side of Camberwell. Spick and Span used a combination of window cleaning methods to get the best results for this client’s Georgian home, using a special window cleaning device that enables window to be cleaned effectively at 35ft. . Spick and Span also used a special cleaning chemical, that leaves glass gleaming when used in conjunction with the hand mop and squeegee technique, that is especially suited to cleaning windows and glass inside the house. The homeowner had a young and excited puppy, so special attention and care had to be taken by the window cleaner in and around the home as the dog was very playful and inquisitive, especially was it important to keep the doors shut to prevent the dog from running into the busy road at the front of the property. 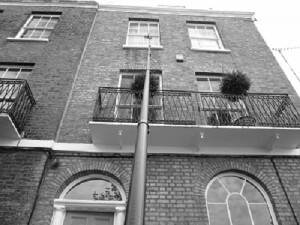 The first and third floor windows at the front of the house were cleaned using the specialized window cleaning device, the second floor had a Georgian iron balcony and so these large Georgian sash windows were cleaned from the balcony ,the garret window’s at the top of the property which the previous window cleaner was unable to clean were cleaned from the outside the property by carefully standing on a ledge.All the windows at the back of the property except a set of french doors a basement and ground floor window and two sash windows and the rear garret window were cleaned using a high reach window cleaning device. After all work had been carried out at the property a schedule was arranged for a follow up clean.The windows of the whole house were cleaned indoors and outdoors in three and a half hours.